Pembina Pipeline has a great business that is well suited to fund a new wave of growth opportunities in a red-hot shale basin. Some of the best investments in oil and gas transportation share three distinct qualities: They have large-scale operations in prolific oil and gas regions, those regions require billions in investment to handle a pending boom in production, and they are conservatively managed with good balance sheets. Most investors are going to look at American companies working in the Permian Basin or Marcellus/Utica shale for these opportunities, but there is one that could be overlooked: The Western Canada Sedimentary Basin (WCSB). This region is set to boom, and Pembina Pipeline (NYSE:PBA) is setting itself up to be the go-to midstream company in the basin. Here's a look at the company's most recent earnings and what Pembina has lined up that could make it a great high-yield stock. DATA SOURCE: PEMBINA PIPELINE EARNINGS RELEASE. EPS = EARNINGS PER SHARE. $1 CAD = $0.76 USD AT THE TIME OF THIS WRITING. CA$ = Canadian dollars. The past few years have been transformative ones for Pembina as it embarked upon an incredibly ambitious capital spending plan five years ago that has transformed the company into one of the largest pipeline and processing companies in North America. The company focused much of its expansion on gathering and processing natural gas and natural gas liquids in the WCSB. As those projects came into service, it has drastically increased earnings. This past quarter's near doubling in operating margin is a testament to many of those projects going live and ramping up to full production over the past year. These numbers also include the impact of its acquisition of Veresen in the third quarter of 2017. What's even more encouraging about these results is that it has drastically shored up the company's finances. The company went from a payout ratio of 72% in 2015 to an estimated range of 55% to 60% for 2018, and it will generate around 900 million Canadian dollars in cash flow after its dividend payments to fund future growth without having to issue debt or equity. 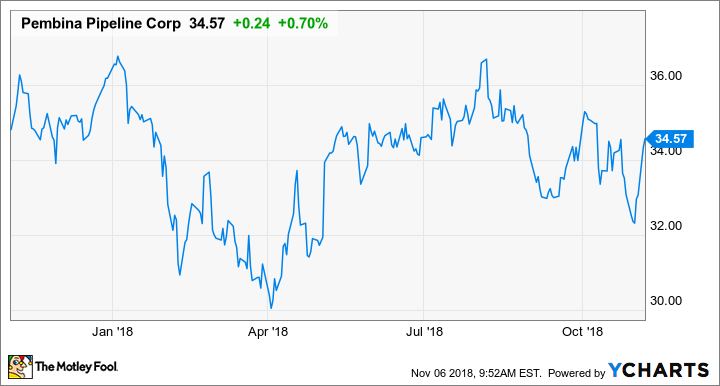 Management felt good enough about this past quarter's result that it even increased EBITDA guidance for the full year from a range of CA$2.65-CA$2.75 billion to CA$2.75 billion-CA$2.85 billion. Data source: Pembina Pipeline. Chart by author. This time last year, the company had put a lot of new projects into service. That was great for operations, but its future looked a little less certain as it didn't have a whole lot of new projects in the hopper. Since then, though, the company has announced a new wave of investments that could drive growth for the company for years. The Western Canada Sedimentary Basin is very much like those buzz-worthy shale basins in the U.S. It is a prolific basin with resource estimates of 500 trillion cubic feet of natural gas, 20 billion barrels of natural gas liquids, and 4.5 billion barrels of oil. Also, like the Permian and Marcellus, the region is drastically constrained by transportation bottlenecks, processing capacity, and access to global markets. Pembina's slate of new investments hits right at the heart of these issues with a Liquid Petroleum Gas export terminal, a large-scale petrochemical manufacturing complex, and a liquefied natural gas export terminal on the U.S. West Coast. These facilities and the associated pipeline, storage, and gathering system expansions to accommodate them give the company more than CA$18 billion in investment opportunities over the next several years. Even more encouraging is that those investment opportunities keep coming. This past quarter, management announced an additional CA$1.3 billion in expansion projects for its existing in-basin systems. In Pembina's press release statement, CEO Mike Dilger opined about the opportunities it has available to it today thanks to the production potential of the Western Canada Sedimentary Basin and the lack of market access that has suppressed Canadian oil and gas production lately. We are as rich in growth opportunities as we have ever been, which is a testament to both our customers and the underlying attractiveness of the WCSB. We are operating a strong and growing base business while extending our value chain by pursuing three exciting projects to access global markets, and we are doing so within our financial guardrails. Our strong business performance has contributed to setting new operational and financial records in each quarter this year, and our future opportunities are numerous and exciting. Pembina has just about everything you would want from a stable, income-oriented investment. It has a conservative approach to debt and how much cash it pays out to investors on a monthly basis (yes, the stock pays monthly dividends), and it funds a decent portion of its growth spending with internally generated cash. Also, its current growth portfolio and future opportunities from an extensive network in the WCSB mean there is plenty of growth in the wings to support years of higher payouts. If there is one thing going against the investment case for Pembina, it's the stock's valuation. The stock trades at a premium to similar large-scale midstream companies on an enterprise value to EBITDA basis, and it has a lower dividend yield even though its projected dividend growth is lower than others in this space. Still, with a dividend yield of 5.3% and a bright future ahead of it, investors should take a serious look at Pembina Pipeline.